Home > Services > FAQ´S > What are the main reasons to buy rather than rent a property in Berlin? Based on your monthly income, we will determine whether the purchase of an apartment or of a house is the right decision for you. We will also take into consideration your individual wishes for your dream property, the amount of your available equity and the current interest rate on loans. When you arrange a non-binding consultation with us, we can inform you about the various rental options and possibilities for financing a real estate in Berlin. RENT CALCULATOR – WHAT IS YOUR HOME COSTING YOU? For a quick overview of what you can expect to afford, use our rent-or-buy calculator below. This uses your current monthly rent to suggest what property price you can afford today. What is your rent per month (without bills)? Are you wanting to seek independent advice on whether it is more worthwhile for you to buy or rent a house or apartment? If so, please do not hesitate to contact us directly. As a real estate agency with 25 years of experience dealing in Berlin’s property market, we recognise a healthy ratio of rent to purchase price when we see one. This is the case when the annual basic rent before utilities is at least three percent of the purchase price. In this case, we would also advise you to buy. Please send us your loan request: What interest applies to the financing of your desired property? Just a few details about the financing are sufficient in order for a member of our experienced team to be able to immediately contact you with an initial assessment of your individual top interest rate. 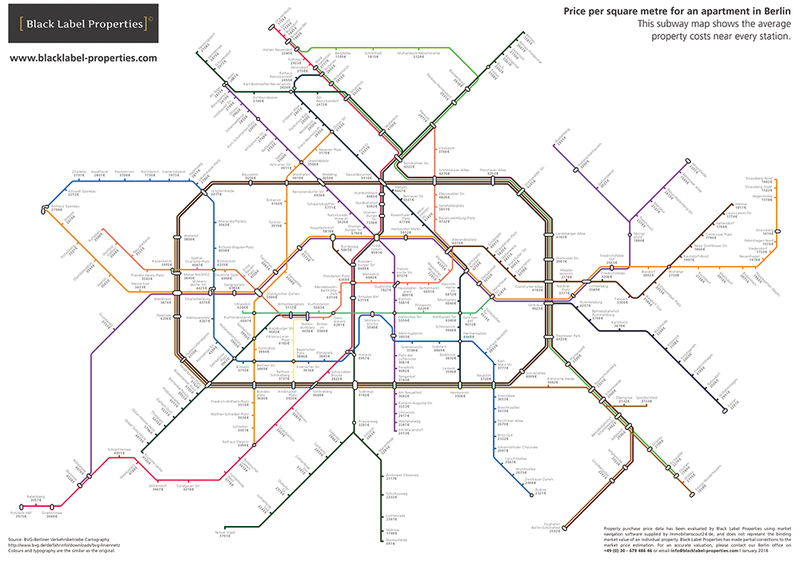 Our Berlin Underground Price Map shows you the average price per square metre you can expect to pay for an apartment near each underground station. Our Berlin Underground Rental Map shows you the average rental income per square metre you can expect to receive near each underground station.